From simple parts to complex components used in modern manufacturing, a wide variety of metal parts are created through photochemical etching. A subtractive process by which small pieces are removed from sheet metal, metal etching has proven to be one of the most effective ways to produce accurate, consistent parts. To learn more about the ins and outs of this process, we’ve provided a helpful overview below. Metal etching first emerged as a sheet metalworking technology over 50 years ago. The earliest applications of the technique were rooted in the artisan space—examples of which include Rembrandt etchings and engravings for medieval swords. While many people continue to view metal etching in this light, the use of the technology has grown rapidly in the last decade. Designers are now leveraging this highly precise corrosion process to solve a number of engineering challenges that are not possible to overcome or become too costly with the traditional route of stamping. This is paving the way for advanced aircraft, low to no emission vehicles and satellite communications, amongst other applications. Metal etching involves the use of acid, rather than heat or sharp tools, to cut into the unprotected surface of a metal. The surface to be etched is covered with an acid-resistant coating, and pieces of that coating are scratched away to reveal the desired pattern. Acid is then applied to the entire object—or the object is submerged in an acid bath—and the liquid erodes the exposed sections of metal. With so many other metal-cutting techniques available, why do manufacturers use metal etching? Because no mechanical forces or heat are required, the original piece retains its strength and integrity and the finished product is free from stresses and burrs. Etching isn’t always practical for large, thick objects; but for thin parts between .0005 in-.050 in., it provides an extremely economical and reliable alternative to stamping, punching, laser cutting and waterjets. A specific type of metal etching, photochemical machining—also known as photo etching—is the ideal way to economically produce complex parts with fine detail. Fundamentally, photo etching is similar to other types of metal etching. A coating is applied to a sheet metal surface, and acid is used to dissolve away exposed areas. Unlike other etching methods, however, photo etching involves the use of hardened photographic film. The film shows the negative image of the part to be created, and two identical sheets are applied to the front and back of the sheet metal. That assembly is then laminated with a UV-sensitive photoresist, which hardens only around the clear areas of the film. The outlines of the parts are left unprotected by the resist, and when the assembly is bathed in an acidic solution, that outlining material is washed away, leaving only the parts of interest. Why should an OEM or manufacturer want to work with photochemically-etched parts? Lead time, quality and reliability. Compared to other metal fabrication methods, photo etching is fast, and the tools used in the process suffer little wear and tear. Due to the low stress and high precision photo etching offers, parts are also stronger, more durable and more likely to meet a tight tolerance. Do you need durable, highly accurate metal components? 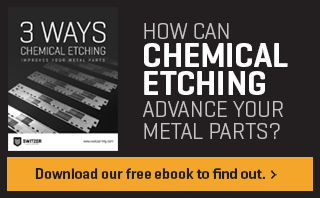 To learn why photo etching may be your best bet, download a free copy of our ebook, 3 Ways Chemical Etching Improves Your Metal Parts.